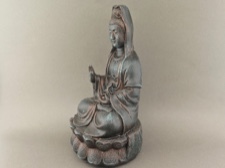 A sweet and simple cast resin figurine of the Goddess Quan Yin. Painted a burnished patina with shades of copper and green. Lovely for a personal altar, or bedside table or any place to help remind us to be compassionate and thoughtful of every one around us. In Sanskrit, her name is Padma-pani, or 'Born of the Lotus.' She comforts the troubled, the sick, the lost, the senile and the unfortunate. She is the goddess of mercy. 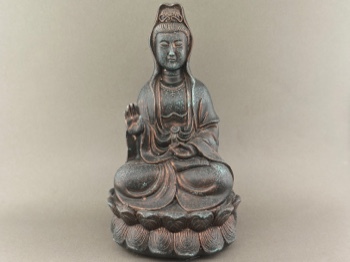 Worshipped universally throughout the Buddhist world with many temples dedicated to this goddess. 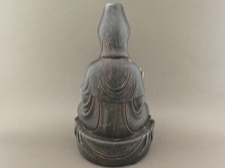 This loving lady sits 5.5 inches tall on a pedestal that is 3 x 2.5 inches.